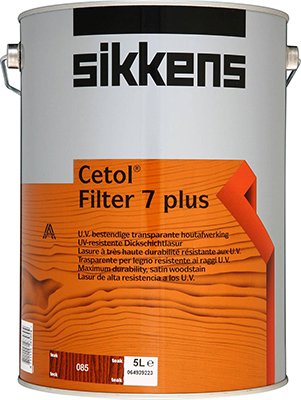 Cetol Filter 7 plus is a highly durable, medium build, solvent-borne woodstain that provides a highly translucent, satin finish and offers outstanding protection from the damaging effects of sunlight. A medium and high durability finish coat for use over Cetol HLS on joinery. Ideal for smooth planed softwoods and hardwoods. Its unique resin and pigment dispersal system combined with ultraviolet absorbers allow Cetol Filter 7 to achieve protection from UV light thereby restricting the degradation of the timber surface in direct sunlight.